Start with the Inner Edge(least patterned plain end) of the Saree, with the Fall (lined border) falling along the inside of the bottom edge. Tuck the Inner Edge into the waistband of the Petticoat slightly to the right side, with the rest of the saree wrapping round to the left. The amount you tuck in depends on how tall or short you are or how long you want to wear the saree. Measure the length of the Pallu (the fanciest patterned end of the saree that falls on the outside so that the design can be seen). This will be on the other end of the Saree from the end you have just tucked in. Take this measured Pallu Length (approx. 1 meter) and take it behind you from your left and forward again from your right. Take the Pallu that you have just brought forward from your right, and fling it over your left shoulder for the time being, so it is out of the way. This is done to see how much of the Saree should be pleated into the waistband. The Saree now left in front of you is pleated to tuck into the waistband. Pleat the remaining Saree into five to six inch wide pleats. Hold all the pleats together, making sure the bottom end is level with the rest of the Saree all round. Tuck this bundle of pleats in one movement into the waistband of the petticoat, thus securing it. The Pallu of the Saree can now be arranged to suit your own style. The style normally and most commonly used is flinging the Pallu over the left shoulder or pleating it and pinning it to the left shoulder, so that the Pallu can swing open at the back. 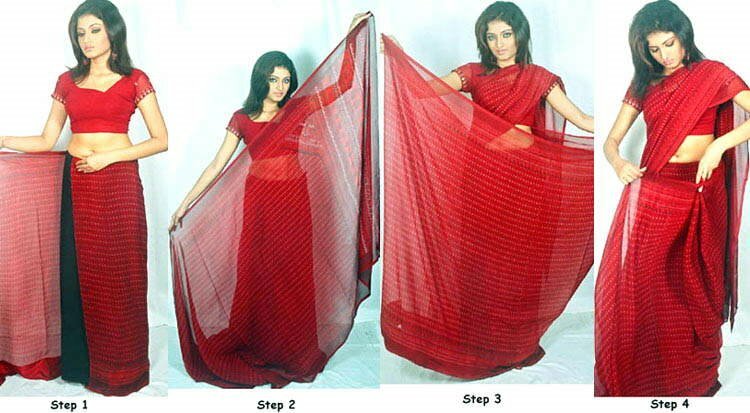 Two of the most popular methods of draping the Pallu are shown below. This is a traditional draping style from the state of Gujarat . It is easier to manage and suited for draping Heavily Worked / Bridal / Silk Sarees. After tucking the pleats into your Petticoat (Step 6) remove the Pallu section from your left shoulder (over which it had been flung earlier to keep out of the way in Step 3). Bring part of the Pallu forward from your back by draping it over your right shoulder. The Pallu can now be arranged into an upside-down fan-shape from your right shoulder. The remainder is left to hang behind in a J-shaped arc from the back of your left hip where it is still tucked into the waistband, to the back of your right shoulder.